The added value Ecolife offers is that it is pressure treated with stabilizers to repel water up to three years, minimize cracking up to 50% and keep boards straighter. 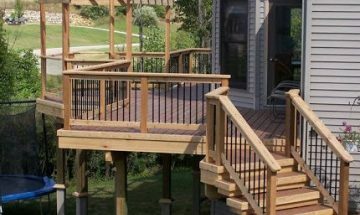 This saves homeowners from having to seal the deck right after installation-- for up to three years! And pros and dealers love it because boards stay straighter and look better longer. Ecolife is one of the most popular pressure-treated wood products used in backyard projects across America. Ecolife is an environmentally-advanced, non-metallic wood preservative for above ground treated wood applications. Homeowners love the beauty of wood. Natural and sustainable, wood treated with Ecolife keeps its beauty longer with seasonal temperature changes and weather extremes. Ecolife is unsurpassed when tested by Mother Nature. Viance stands behind the added-value Ecolife provides with a Lifetime Limited Warranty.